Jungle has overtaken the now barely visible site of Lohiau's house. 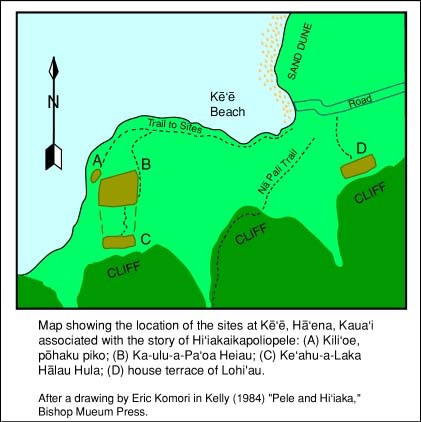 Sites of significance associated with the story of Hi'iakaikapoliopele include Lohiau's house platform, still visible near the head of the Kalalau trail, opposite Kee Beach. 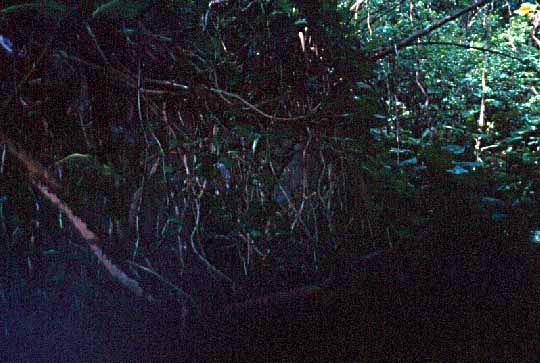 A stone wall in the forest, now much covered by vegetation, is the front face of the site. It is in close proximity to Kee beach, but unmarked and obscured by the overgrowth. "The sad remnant of King Lohiau's residence foundation lies approximately 50 feet upland from the end of the Kaumualii Highway... the royal foundation was terribly wrecked some years ago by the county of Kaua'i, by hauling stones from it for road building, running in a bulldozer, and even blasting rock. Through this utter lack of comprehension of the preciousness of Hawaii's unique heritage bequeathed us by the ages past, and its complete lack of foresight concerning the great value of Kauai's then potentially foremost legendary relic of antiquity, was irreparably destroyed this fascinating place of interest to our island people, our posterity, and our host of visitors from afar." A little further beyond the beach, on the small peninsula separating Haena from the next valley, lies the hula school dedicated to Laka and Ka Ulu a Paoa heiau.